Instructables has a rundown on Electrolytic Rust Removal aka Magic. It’s a simple process of using a 5 gallon bucket of water with 5 tablespoons of washing soda (sodium carbonate) as an electrolyte. Rebar is suggested as the sacrificial anode. The part to de-rust is connected to the negative lead of a trickle charger. An explanation of the process is at Electrolytic Rust Removal. Safety precautions include keeping the charger electronics away from anything liquid, protecting yourself from the alkaline solution with skin and eye gear, and using a well ventilated area with appropriate precautions for the hydrogen and oxygen released from water electrolysis. Note that this process just loosens the rust. You’ll still need a bit of elbow grease to finish the cleaning. Here’s a look at all farmers markets in Nevada, as currently confirmed. This focuses on Northern Nevada but also includes eastern and southern Nevada. Click on the pinpoints for the day of the week, plus hours, date range and contact info when available. Check it to find fresh vegetables near you! It started out as a cake decoration. 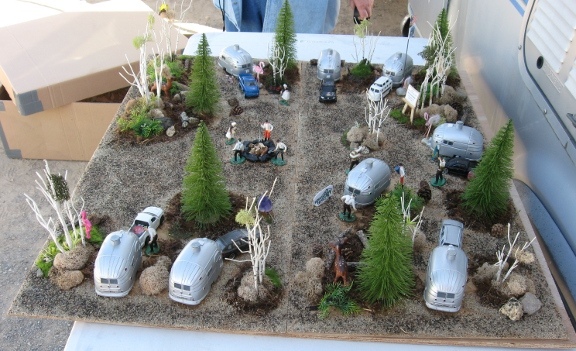 Nowadays the SNU Diorama is a virtual rally or a model of a typical SNU rally. Those familiar with the real rallies need to study the display as there are a lot of points of correspondence with some nuance. Notice any problem getting to this website or sending to a SierraNevadaAirstreams.org e-mail address? On the Thursday night before the Memorial day weekend our web hosting service had to make some emergency moves that discombobulated services for a while. Websites were back up late Friday afternoon. E-mail seems to be back in gear Sunday. The National Motorists Association has compiled state rankings for the Memorial Day Weekend 2009 to determine where you a most or least likely to get harassed on your trip. The criteria listed at the bottom of the ranking list includes such things as speed traps per capita, roadblocks, freeway speed limits, courts structure, traffic enforcement camera use, toll roads, helmet laws, move over laws, and other such things. Out west, Oregon hits #12 and California #14 worst. Arizona and New Mexico came in at the middle of the list. Nevada hits the list at #30 and Utah at #41. Montana, Idaho, and Wyoming came out as the least obnoxious driving states. The National Motorists Association (NMA) was founded in 1982 to represent and protect the interests of North American motorists. We began by combating the 55-mph National Maximum Speed Limit and we continue to support efforts to retain motorists’ freedoms and rights. We work for more reasonable speed limits and fight for better driver training, fair enforcement practices and important privacy protections. The NMA believes in freedom and responsibility to make choices, not in “one size fits all” legislation, ticket cameras, unfair driving taxes, revenue-motivated traffic courts and speed traps. The NMA supports traffic laws based on sound engineering principles and public consensus – not political agendas. Sometimes the bug bites and an RV becomes a bit more than an abode for those times away from home. 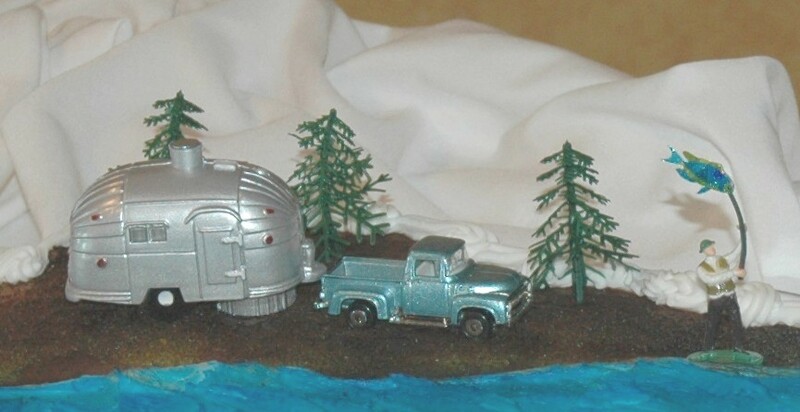 Airstreams just for fun is a photo gallery of trinkets and collectables on the Airstream RV trailer theme. China is home to some of the most spectacular mountains, and some of the deepest gorges that need to be spanned with ridiculously tall bridges – and all these infrastructure projects are supposed to be good for Chinese economy. The post has links to Parts 1 and 2 – all are worth perusing if you want to see pictures of some places to travel that are spanning the distance. And, speaking of those bridge architects … See the Nevada DOT’s I-580 freeway extension construction website. The Honda EU2000i portable genset is extremely popular in RV circles. It is quiet, easy to handle, and great for charging batteries or for temporary power needs. The only problem is that you need two of them to run the air conditioner. The next bigger model, the EU3000IS, will handle the AC but is much heavier. Now Honda has come up with its EU3000i Handi that provides the power to start and run 13.5 class AC without the weight of the 3000IS. The weight reduction was done by removing the electric start, reducing the fuel tank capacity by half, and a bit less sound reduction. The Handi is about 2/3 the size of the IS and the engine is a bit smaller, too. The runtime on a tank of fuel is reduced by half – to about 4 hours. The sound is up by a factor of 4 (although still quiet as far as portable gensets go). With a full fuel load it is still near 100# which is still almost twice that of a 2000i. Note that altitude reduces the power available from a genset. A 2000 watt genset that can produce 1600 watts continuous is almost enough to power and AC except for the compressor startup. That compressor startup can even challenge a 3000 watt genset depending upon circumstances. Besides 2 gensets, which have to be of a type that allow connecting in parallel, you could use a power sharing device like the Victron MultiPlus that will augment the genset with battery power to get the compressor going and then, if the genset can handle it, use any available power capacity to charge the battery. There is a Dear Fellow RVers letter posted for those who haven’t figured out that you don’t camp in a commercial parking lot. When these supposed RVer’s put down jacks that go through the asphalt, dump their tanks in the parking lot, or otherwise do other than park a few hours, they shine a bad light on all. Used to be you could just pull of the road near anywhere and have a picnic or a long stop. No more. Even roadside rest areas in some states can prohibit resting (Nevada allows 18 hour stopovers in its roadside rest areas). Let’s do our part to help assure alert and rested drivers by being good neighbors in our travels. Coffee Paraphernalia is devoted to showing interesting examples of coffee makers – keep scrolling as it is a long page. Check out the links at the top, too. The Technical Page takes a trip inside your coffee maker. Well illustrated and some interesting stuff about getting coffee into your cup.